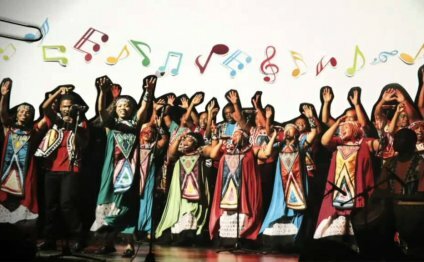 The highly acclaimed gospel choir reached a musical milestone with the November 1996 release of a twelve track spectacular album, "The Georgia Mass Choir: Greatest Hits." The world also heard the Georgia Mass Choir in the globally televised 1996 Olympic Games in Atlanta, during which the choir performed six times - including in the Opening Ceremonies and the healing re-opening ceremonies of Olympic Centennial Park, after the infamous bombing. The group has continued to be honored with Stellar, Grammy and Dove Award nominations. This faith-filled vocal powerhouse also is featured in Disney's major motion picture, "The Preacher's Wife." Three of the choir's signature songs from "Greatest Hits", "He's All Over Me, " "Joy and Hold On, " "Help Is On The Way" - are on the movie's soundtrack CD, "Preacher's Wife". Star and recording superstar leads choir selections. Director Penny Marshall cast the choir. The group joined her and Houston on a national media tour promoting the movie. Appearances included TV's Saturday Night Live on NBC, NBC's Today Show and ABC's Good Morning America as well as performances at The Ebony Awards and at Disney World. The choir's popular and critical success has been hailed in such major music magazines as Billboard, Jet, Ebony and Gospel Today. Other honors range from the GMWA Excellence Award to receiving the keys to the City of Atlanta. The Georgia Mass Choir may be available for your next special event!